• For quantitative determination of glutathione peroxidase activity and evaluation of drug effects on GPX activity. • Sensitive and accurate. Use 10 μL sample. Linear detection range 40 to 800 U/L GPX activity. • Glutathione peroxidase (GPX, EC 1.11.1.9) represents an enzyme family with peroxidase activity whose main biological role is to protect the organism from oxidative damage. It helps prevent lipid peroxidation of cellular membranes by removing free peroxide in the cell. GPX catalyzes the following reaction with glutathione reductase (GR), Simple, direct and high-throughput assays for GPX activity find wide applications. 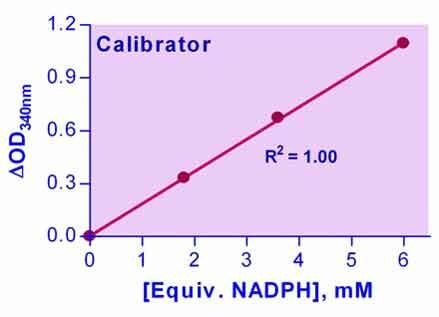 BioAssay Systems improved assay directly measures NADPH consumption in the enzyme coupled reactions. The measured decrease in optical density at 340 nm is directly proportional to the enzyme activity in the sample. 1. Aghwan, ZA et al (2013). Blood Haematology, Serum Thyroid Hormones and Glutathione Peroxidase Status in Kacang Goats Fed Inorganic Iodine and Selenium Supplemented Diets. Asian-Australasian Journal of Animal Sciences (AJAS) 26.11: 1577-1582. Assay: Glutahione Peroxdiase in Deer Blood. 2. Chen, Weiwei, et al (2014). Lycium barbarum Polysaccharides Prevent Memory and Neurogenesis Impairments in Scopolamine-Treated Rats. PloS one 9.2: e88076. Assay: Glutahione Peroxdiase in Rat Hippocampal Tissue (Pubmed). 3. Calamita G et al (2012). Biophysical assessment of aquaporin-9 as principal facilitative pathway in mouse liver import of glucogenetic glycerol. Biol Cell 104(6):342-51. Assay: Glutathione Peroxidase in Human blood (Pubmed). 4. Effendy, NM and Shuid, AN (2014). Time and Dose-Dependent Effects of Labisia pumila on Bone Oxidative Status of Postmenopausal Osteoporosis Rat Model. Nutrients 6(8): 3288-302. Assay: Glutathione Peroxidase in Rat bone tissue (Pubmed). 5. Ahmed, MA et al (2014). Pomegranate extract protects against cerebral ischemia/reperfusion injury and preserves brain DNA integrity in rats. Life Sciences 110(2): 61-9. Assay: Glutathione Peroxidase in Rat brain tissue (Pubmed). 6. Abdel-Latif, HMR and Khalil, RH (2014). Evaluation of two Phytobiotics, Spirulina platensis and Origanum vulgare extract on Growth, Serum antioxidant activities and Resistance of Nile tilapia (Oreochromis niloticus) to pathogenic Vibrio alginolyticus. Intern. J. Fisheries and Aquatic Studies 1(5): 250-255. Assay: Glutathione Peroxidase in Fish Plasma.